JD at Get Rich Slowly talks about Money Myths and the Importance of Thinking for Yourself In one point he challenges the idea that money can't make you happy. He also found out a study about credit card spending often sited by Dave Ramsey doesn't actually exist. Donating appreciated stock to a charity to avoid the taxes is a trick I've heard of before. But this idea is a little different that uses the charity donation trick to reset your cost basis. The bad news: My lawnmower up and stopped working all the sudden recently. It is a cordless electric mower (Black & Decker model CMM1200 ) and it simply stopped working abruptly. I first thought that the battery might have just died, so I connected the charger to it for a long while but that didn't help. The good news: Luckily for me the 2 year warranty still had a few days in it so I was able to get it repaired entirely free of charge. YAY. The warranty and repair process with Black and Decker was very easy and hassle free. My wife took the mower to the repair center and dropped it off. They didn't require a receipt or give us any hassle about the repair. They called us a few days later to tell us the mower was fixed and ready for pick up. Simple as that. Newer versions of the cordless mower from B&D can be had for about $350 nowadays and I was afraid that it would be entirely dead and I'd have to replace it. I could get a normal electric mower with a cord for much less, probably around $150 to $200. But I really enjoy having a cordless electric lawnmower since I don't have to fight the electric cord while mowing the lawn. I figure that not having to deal with the extension cord saves me 10-20 minutes and quite a bit of annoying hassle while mowing my fairly small lawn. That is absolutely worth the extra cost of a cordless model to me. I also generally like electrics since they save money on gas and don't spew out as much pollution. My previous electric lawnmower had lived around 10 years and was still working fine when I gave it to a relative. This one worked perfectly for nearly 2 years without any issues. Overall I've had much less problems with the electric mowers that I've owned than the gas powered mowers that I used growing up. The gas powered mowers have many more moving parts that could potentially fail. The electric mowers are essentially little more than a basic electric motor which is not as prone to failure. Of course this is more my opinion based more on personal experiences. I'm not sure what the exact failure rates are for electric versus gas mowers but my opinion is electrics are more reliable. So while I was momentarily annoyed that my mower broke down I ended up with a very positive experience with the Black and Decker warranty & repair service. I give Black and Decker a thumbs up. I wrote Evaluate the Quality of Your 529 Plan Options as a guest post at GoBankingRates.com. You can follow the link to the GoBankingRates.com post for the full article. Recently my wife and I adopted a dog. She is an older small dog whos owner was no longer able to care for her. So far we've fairly quickly spent north of $2000 on the dog in the first few weeks. I jokingly call the dog a "money pit" but I don't have that kind of negative feeling about it nor do I feel that the money we spent is wasted. A large part of the expense has been vet bills. I talked a while ago about what pets cost. So it shouldn't have come as any surprise to me that the dog might end up being expensive. We've had vet bills $160, $350 and another for over $1100. The first bill was just a routine checkup when we first got the dog. But then she got sick and we had to get her tested and then some minor surgery done. No need to worry, it wasn't anything too serious (teeth problems) and she seems to have recovered fine. Hopefully the dog's major health problems are over both for her comfort and for our financial well being. We spent $250 on a carrier and dog house. We also spent about $100 on other miscellaneous dog stuff. We have a couple bills from Petco and Petsmart on dog stuff. I know we bought leashes, dishes, dog bed, a dog toy, and I'm sure some other stuff. Somehow that all added up to $100. I think when we talked about getting the dog I somehow just discarded thoughts of having to buy much "stuff". Maybe I assumed we woulnd't really need any of it. But then when we got the dog I found out we did actually end up having a need for a bunch of "stuff". Then there is the $150 we spent on boarding her when we went out of town for a long weekend. Boarding the dog is one of the expenses that I actually thought about before we adopted her. We can generally leave our cat at home without worrying about her since she has a litter box. But the dog has to be taken outside so we're looking at dog sitter or boarding. Then every time we go on vacation or are out of town we will have to pay for boarding or find a friend/relative to dog sit. We're spending about $15-$20 a month for food. The food for the dog is actually not very expensive though it will add up. She is a fairly small toy size dog so she doesn't eat all that much. But we do have to buy her canned ground food since she is pretty old and has fairly bad teeth and can't handle dry dog food very well. Now over half of that is vet bills due to the dog getting sick and needing surgery. If she hadn't gotten sick then we'd have spent only about $700. A good chunk of our spending thus far is not ongoing costs and so our future expenses shouldn't be as bad. My wife and I had not really budgeted for the dog. I don't know why we didn't think it through, but we didn't. When I wrote about what pets cost I clearly recommended that people properly budget for a pet and I then totally failed to use my own advice. I had in my mind a clear expectation that the dog would cost us a chunk of money but we didn't sit down and talk about the likely or potential costs. On the day we decided to adopt her I would have probably given a ballpark guess that she would end up costing us "a few hundred dollars a year" based on nothing more than my basic perception of the cost of animals. I wouldn't say that getting the dog was a 'financial mistake' since we're able to handle the additional cost and we would have gotten the dog in any case. The cost of a pet can easily add up and you really should make sure you budget for the expense before you get the pet. I didn't take my own advice in this matter but we really should have. HSH website has a Mortgage rate Trends and analysis tool which has lots of data on historical mortgage rates. The data covers monthly data points from 1987 to 2010. They have info on 30 year fixed, 15 year fixed and ARM mortgage rates. You can also look at the rates for individual states and even drill down to individual metro areas as well. The data doesn't go back to 1987 for all areas. So if you want to see how a 30 year fixed FHA mortgage compares to a 30 year 7/1 ARM in the Houston, Texas metro area from 1990 to 2000 then this tool will give you all the figures and plot a nice graph. Mortgage: The home mortgage figure includes the principal and interest payment as well as escrow account for property tax and home insurance. This does not include extra principal payments we make above our mortgage payment. Home improvement : was fairly high since we had our front lawn redone. 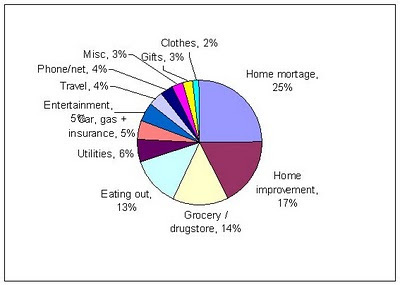 Grocery / drugstore: This is kind of a catch all for household spending including groceries and household items. I put anything from the major department stores in there like Target or similar. That category undoubtedly includes stray spending on clothing and other items. Eating out : Fairly self explanatory and includes any restaurant bills. Utilities: This includes electricity, water, garbage and home security bills. The electricity is the biggest expense in this category. Automotive expenses: This is auto insurance about $1600, gasoline about $1200 and any other car bills like repair or maintenance. Entertainment: This includes cable TV and any shows or sporting events we go to. Travel: Any cost for travel including airfare, hotel and entertainment specific to travel. Phone / net: This is our home phone bill, internet bill and cell phone bill. Misc: This is generally individual spending of myself or my wife that isn't in a our other major categories. Gifts: Money given to charities or friends. Clothing: Most of our clothing costs. I do not include spending specific to our rental properties in our household budget. Those expenses are our rental expenses and I keep that stuff separate. Most of our spending is by choice and conscious. We are spending much less than we earn so I do not feel there is any problem with our spending level. We could cut back on spending in most areas if we choose to. Our home mortgage, utilities and auto expenses are generally fixed and we wouldn't be able to cut those areas much at all. Our eating out, entertainment and travel are all luxury spending that we choose to spend on. The grocery, drugstore, and misc. are a mixture of some required spending and some extra spending. We could cut back on grocery spending if we needed too but currently choose to spend how we do. While I don't think we have over spending problems we should continue to watch our spending and make sure we aren't wasting money. We should also do a better job of accounting for our general 'grocery / drugstore' category of spending. That category is the third largest but I don't track the specifics of that spending very well at all. After the Super Bowl this year CBS premiered their new show Undercover Boss. The show has had enough success that it has been renewed for a second season. I'm not above admitting that I watch reality TV on occasion. Undercover Boss looked pretty interesting so I decided to watch some episodes. I quickly grew tired of it for a number of reasons. First off, the show is a giant advertising billboard for the company featured each week. They seem to say the name of the company a million times and show their company logo about 20 times a minute. I wonder if the companies shown on the program pay them for 60 minutes of advertising time? It should be worth a lot of money to get their company name and logo that much air time in front of millions of viewers. The show has a formula that seemed pretty consistent for the episodes I saw. Basically they show hard working employees who we are meant to identify with, they feature the CEO rewarding employees who deserve it and fixing things that need fixing, the CEO is made to look like a good guy who is down to earth and feels he must do the right things and they sprinkle in tons of positive comments about the company and their history. There are a couple scenes at the start of each episode. First they show the boss at his home which is a nice house but not a giant mansion. Or if it is a giant mansion then they may film it to down play how giant it is by showing a tight shot of the front door and parking the Lamborghini in back. They also make a point of how the boss stays in a low budget hotel. Why do we need to know that he is staying in a low budget motel? We don't really, it has nothing to do with anything. But they need to point this out to us every show in order to underline how the CEO is not above staying in a Motel 6 or equivalent and emphasize how the CEO is not staying in the Ritz. Staying in a low budget motel demonstrates that the CEO is just a regular guy at heart and not a 'Wall street fat cat'. The bulk of the show is the part where the CEO goes into disguise to live among the average employees and find out what his actual employees actually do for the company. They make the boss do a few different entry level style jobs. Most of the work he does OK at, but its his first day so nobody can be really good. The boss will fail to perform properly on at least one of the jobs. Usually you'll have at least one of the people supervising the CEO will fire them or otherwise criticize their poor performance. I guess this shows how the CEO humbles himself and learns how hard real work really is. Regular people do hard jobs and the show is telling us all this fact. While the CEO is doing the jobs you get to meet all the regular people who work at the company. The regular people seem to include someone with either cancer or kidney failure. They include hard working average Joes who toil away at hard labor to support their families and might be an immigrant. The workers also include talented people with special gifts. When we meet all these people we get to identify with them and see how nice they are. This tells us that the employees of the company in question are hard working and nice people that we can root for. When the CEO meets these people he gets to reward them cause the CEO is a benevolent person. All it took was a TV show for the CEO to grant boons on the common folk. The CEO should find something wrong that they "just have to" fix. This shows that the CEO isn't really aware of how things can be done wrong. But of course if the CEO discovers something wrong then he will fix it cause he's a good guy at heart and wants to fix the wrongs of the world. He often fixes this by calling someone on his cell phone while sitting in his SUV in the parking lot. This shows us just how urgently he decides to treat the thing that has probably been broken for years and neglected by his entire organization until a film crew showed up. At the end of the show have a staged little event where the CEO and a few dozen employees have a meeting. The CEO makes a speech, they show clips from the show, employees cheer and laugh and a good time is had by all. I have to give some credit to the ad wizards that came up with this one. Wrapping corporate propaganda in a the guise of a television show and tricking us into thinking it is entertainment was a great idea. The other day I talked about how to do the full calculations to estimate your Social Security retirement benefits. The retirement benefit amounts from SS are not a direct % of your income levels. The benefit amount as a percent of your pre retirement earnings is higher for low income and lower for higher incomes. In other words lower income people get a higher % of their income in benefits than do higher income earners. 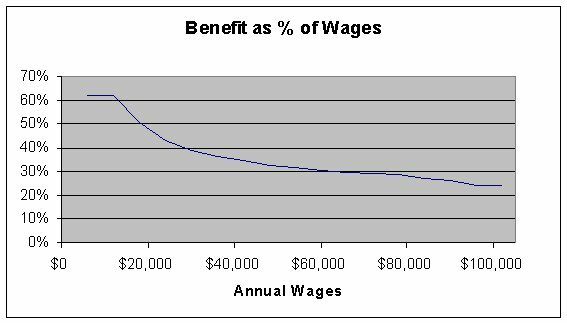 The SS benefit is not a direct 1-to-1 slope of your wages, but you get 90% of your first bit of wages, 32% of the medium chunk and 15% of the top. That creates a graph of varying slope. Someone who made $24,000 before retirement may get a $867 monthly benefit which equates to 43% of pre-retirement earnings but someone who makes $72,000 a year before retiring may get about $1,752 in SS benefits which is 29% of their pre-retirement income. I ran a bunch of trial numbers and made some charts below to demonstrate the rough relationship between wage levels and expected Social Security retirement benefits. Note: These figures are pretty rough and only based on estimates. Your exact SS earnings will differ depending on your work history. Below is a chart of the estimated Social Security retirement benefit that you might earn given an average inflation adjusted lifetime monthly income level. Note that this is not exactly the same things as estimating your SS benefit based on your current monthly income. If you use the social security quick calculator to estimate the benefits then it will give you a bit different benefit estimate. 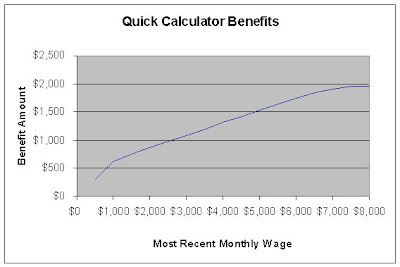 Generally the quick calculator seems to result in benefits around 20% less than I'm showing. Below I show the results from plugging various income levels into the quick calculator. The amount you get in benefits as a percentage of your pre-retirement wages goes down as your wages increase. As I pointed out before someone making $24,000 gets about 43% and someone making $72,000 gets about 29%. If you make a relatively low income level of less than $12000 a year then your SS benefits will replace close to 60% of your income. If you have a much higher income level of over $100,000 then SS will give you around 24% of your pre-retirement income. Bargaineering gives a run down of How Much is Minimum Wage? Pop Economics asks Why do we work so much? The Simple Dollar investigates the question Does Rewashing Ziploc Bags Really Save You Money? How Are Social Security Retirement Benefits Figured? Once a year I get a Social Security Statement (like this) in the mail from the Social Security administration stating the earnings I've paid taxes on thus far and what my estimated benefits would be when I retire. If you are a worker over 25 you should be getting one too. My earnings is pretty straight forward and the amount of wages that I paid SS tax on. How they obtain the estimate the social security retirement benefit is more of a mystery to me. I know they figure your benefits somehow proportional to your taxed income but I don't know the formula. I decided I'd find out how they calculate Social Security retirement benefits and it turns out its not too complicated. The details of the benefit calculations are covered in Your Retirement Benefit: How it is Figured on the Social Security website. You could read that website and it does a pretty good job of explaining how they calculate the benefits. I'll give my explanation and summary of the process below. Income considered is capped at maximum SS contribution: If you make more than the maximum SS contribution in a given year than its capped at the maximum. So for example if you did very well last year and made $130,000 then that is well above the $106,800 cap on income for SS. So they would just use the $106,800 figure. Older years Inflation adjusted: The income levels are adjusted for inflation using a table of index factors per year. The older years are multiplied by higher numbers. If you made $60,000 in 1995 then it would be multiplied by the index factor of 1.67 and count like $100,200 in todays dollars. Therefore it would count higher than making $60,000 in 2009. Use your best 35 years of income: Your 35 highest years of income (after inflation adjustment) are used to figure your SS benefits. If you contributed to SS for more than 35 years then the additional years are simply ignored. They only consider your 35 years of highest income levels. If you contribute for less than 35 years then the years you do contribute are averaged and the fewer years will lower your benefits. For SS benefit purposes its better to work 35 years for 5% higher wages than work 45 years for 5% lower wages. Averaged out to Monthly rate: Your average income level from your 35 highest income years is averaged to an average monthly income figure. The incomes from your 35 highest years is divided by 420 to find the monthly figure. Benefits portion of monthly rate: Your average monthly figure is used to figure your benefit rate. The benefits are based on a portion of your monthly average. You get 90% of the first $761, 32% of the the amount between $761 and $4,586 and 15% of anything over $4,586. 1) Take your actual income per year and cap it at the maximum level. 3) Pick your 35 best years and add them up. 4) Divide that total by 420 to get an average monthly figure. 5) Then you get 90% of the first $761, 32% of the next $3,825 and 15% of the rest. So those are the basics of how they figure your social security benefit. Now keep in mind that this is the amount you get when you retire at the full retirement age (currently 66 years old). If you retire at age 62 then you get 75% of the maximum benefit. Your spouse may also be eligible for spousal benefits if they don't qualify for their own SS. Lets look at some examples of how this all works. While your actual income level in 1965 was only $4,000 and your 1990 income was $15,000 if you adjust these for inflation then your 1965 income is worth more. The fact that they only consider the highest 35 years of income can mean a lot of different things to you. If you work most of your life at put in over 35 years then occasional down years due to unemployment or illness won't significantly impact your SS benefit. You only have to work 35 years to max out your benefits. But working more years at higher income will increase your benefit rates. Once you've worked 35 years then adding additional years at lower income level won't change your SS benefit at all. i.e. if you work 35 years and retire early then don't work extra for low wage just to keep SS higher. If you work fewer than 35 years then the non working years will lower your average but as long as you work the 10 years minimum to qualify you'll get benefits. Generally the more years you work from 10 to 35 then the more benefit you will get, but after 35 you get no further increase to benefits. Starbucks : Free brewed coffee all day if you bring your own mug. Taco, cup of coffee and 2 bite sized cupcakes sounds like a free meal to me. Tax day is upon us. Our tax refund is about $4,000 this year. Thats combined refund between federal and state taxes. Our effective federal tax rate is 13.9% which is a bit less than the 14.9% rate last year. But I think this years rate includes the approximately $1200 we received in tax credit from air sealing and insulating our home. We don't have any special goal for the tax refund in mind at this point. It will go into our savings. How Much Do Mortgage Interest Rates Change Year to Year? A while back I did a plot of the historical interest rates on 30 year mortgages from 1971 to 2008. We can take that data to see how much the interest rates change from year to year. 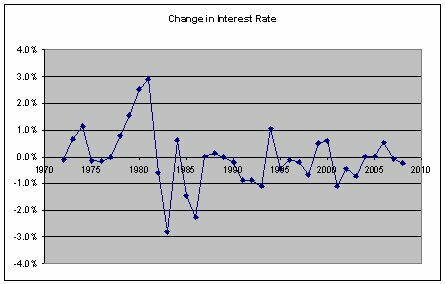 Out of the 37 years the interest rate changed by less than 1% (plus or minus) 27 times. The rate changed from 1% to 2% a total of 6 times. Rates changed by over 2% only 4 times. The majority of years rates grew or dropped by less than 1%. Taking a little closer look at the data we see that most of the changes in the 1-2% range were 1.1%. In 5 years there was less than 0.1% change in the interest rate or virtually no change. You can notice a particularly bad stretch from 1977 to 1981 when interest rates went up considerably every year. That 4 year period saw rates climb almost 8%. The largest drop was in 1985 to 1987 when rates dropped 3.7%. Bottom Line : Most of the time rates change less than 1% a year. However some years rates went up or down almost as much as 3% in a single year. Rates can climb as much as 8% over a 4 year period. The air conditioning went out at one of our rentals the other day. The AC unit is apparently around 15 years old now so it isn't going to last forever. The bill to repair the AC is around $400. We asked how much it would cost to replace the entire unit and they gave us a ballpark estimate of $4,000. To repair the unit or replace it is a tough decision to make. If we repair it we're gambling that it will last longer and not just break down again in 2 months with a bigger repair bill. If we replace it we're shoveling out piles of money that may not be necessary. If it were a kitchen appliance or a cheaper item then I wouldn't even think of paying any sizable repair bill and we'd simply buy a new replacement. Consumer Reports looked at the question for such things as kitchen appliances and their general advice is : "Replace any for which you paid less than $150 and nix any repair that costs more than half the price of a comparable new product" That sounds like good advice and probably about how I'd handle something. I'd also add that I'd replace any appliance that has broken down and already hit its expected life span. If you add in potential energy savings costs of getting a more efficient modern appliance then that makes the decision to replace an old broken unit much easier. For kitchen appliances the choice to repair or replace is fairly easy decision. For a major system like AC or a furnace the question gets more difficult. I'm hoping (fingers crossed) that the AC at the rental will be fine for a few more years. Its difficult to bite the bullet and lay out $4,000 for a new unit. That is a lot of money to spend up front. Logically part of my mind is telling me that we should just go ahead and eat the cost and get a replacement. We'll have to wait and see. My wife and I recently took a trip to visit relatives and we had our first introduction to airline baggage fees. I knew in advance that airlines were charging fees but we decided to check bags anyway. I understood that the airlines charge around $20 for a bag so I figured that wasn't a big deal. Course for some reason I didn't realize they charge the fee both directions on a two way flight, for two people its twice as much and the actual fee was $25 so it ended up being $100 for the both of us round trip. I really don't know why I didn't expect they'd charge the fee both directions, but they do. That made my expected $50 actually $100. A $100 fee for bags seems like a lot. But if the tickets had been $50 extra each then I wouldn't have balked at that. Generally I think if the airlines charge fees for ala carte extras then that is fine with me. Checking bags is not necessary for everyone and I see no problem with the airline charging extra for it. If you use it you pay and if you don't you save the money. If you want to save the money then pack light, its really as simple as that with few exceptions. It seems that almost all of the airlines are now charging fees for checked bags. The site Airfarewatchdog has a summary list of arline bag fees. Its a couple months out of date so it is probably best to check the airline directly for current fee rates. The only thing I really don't like about this policy is that is if you do decide you want to check bags then it makes price comparison when shopping for airfare a little more difficult. You can't just search for fares and compare the prices you also then have to find out the bag fees and add that on top to get the real price. At least a couple blogs discussed the topic of Spirit airlines charging for carry on bags. Consumerism Commentary's take Spirit Airlines Now Charges for Carry-On Luggage and Lazy Man and Money guest post Airline Ticket Pricing Flap: Extra Fees For Carry On Baggage? This coupon is good for a FREE ream of paper at Staples. But hurry its only good through April 10th. Found this one via Wisebread. After the recent plummet of the stock market many people close to retirement age found themselves without nearly enough money to retire as they had planned. Most employees today have only a 401k and no traditional pension plan. So their retirement is left primarily in their hands and depends on their investment choices. There is no guarantee that your 401k will perform well enough to give you the money you need at retirement. Personally I think it would be nice if every worker had a safe pension plan. But you can effectively build your own pension using your 401k or IRA investments. If you combine bonds and annuities then you can create a retirement savings plan that models a pension and is very safe with little risk of loss. The bond investment is quite safe. High credit rating AAA bonds only rarely default and investing in bond funds reduces the risk of loss from defaults considerably. 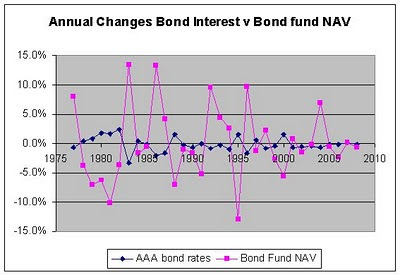 Historically AAA rated bonds returned 6% annually. You don't have to worry about a recession or economic 'bubble' bursting and wiping out half of your retirement. On the other hand the returns from bonds are lower than what you might expect from investing in stock market equities. There are some downsides to investing in bonds that we should be aware of. The return rates from bonds are not as high as stocks. This is part of the trade off. You won't have as much potential for gains but of course you won't have the high risks of losses from stocks. Bond investments are not guaranteed and there is a chance a bond fund could be mismanaged or that direct bond investments can be defaulted on. However the risk of loss in bonds is lower than the risk of loss in the stock market. In order for this strategy to work you will have to put away around 15% of your pre-tax income. If you get 6% annual return on bonds and save 15% of your income then over 40 year working career it should add up to enough to replace around 50% of your working income. Saving 15% of your income may sound like a lot. Your employer 401k matching funds can help get you to the 15% mark. For example if your employer matches up to 3% of your contribution then only 12% of the savings comes out of your own pocket. Investing in a 401k also means this is pre-tax funds so it is less out of pocket than if you had paid taxes on it. A fixed immediate annuity is a contract between yourself and an insurance company. You pay them a lump sum of money and they in turn agree to pay you fixed monthly payments for a given time period. Traditional pensions work in a similar way. By buying an annuity at retirement you take away the risk that you may outlive your retirement nest egg. The major down side to annuities is that you end up with no money at the end of your life. While your retirement income will be secure you will not retain any wealth to pass to heirs. I would also be careful to research your annuity purchase to make sure you are not paying excessive fees and that the insurer is sound. The future of Social Security is uncertain for sure. I for one do not think that SS is going away any time soon. But it would be far too optimistic to assume it won't change to some degree in the future decades. I would not depend on SS benefits to be unchanged in future years. 1. Save 15% of your take home pay in a tax sheltered account. 2. Invest your retirement funds in bond funds with an expected return of 6% annually. 3. When you retire use your retirement savings to purchase a lifetime annuity for guaranteed retirement income. Following these 3 simple steps should get you a retirement income of around 50-60% of your pre-retirement earning level. If you add today's Social Security payment rates on top of that then you could expect it to contribute another 25-30% to get you up to 75-90% total. Lets take a look at a family that has made median income level for the past 40 years and is about to retire. If they had made median income and saved 15% of it in bonds and you made 6% annual average return on your money. If you had done this for the past 40 years then you would have approximately $500,000 in your retirement account. I got some quotes on annuities at Immediate Annuities.com. A couple in their mid 60's could buy an annuity with that $500,000 to give them approximately $2,600 monthly income for the rest of their lives. 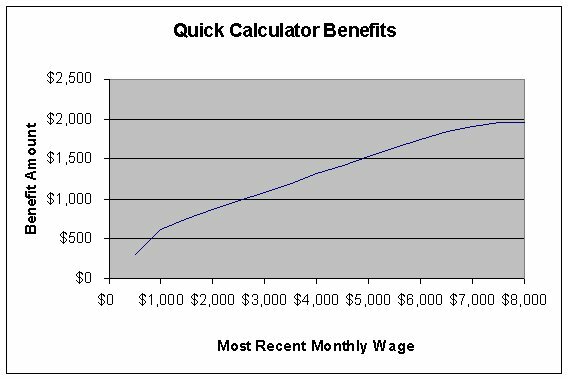 You can use the Quick Calculator at the Social Security benefit calculator page to estimate your SS income at retirement. 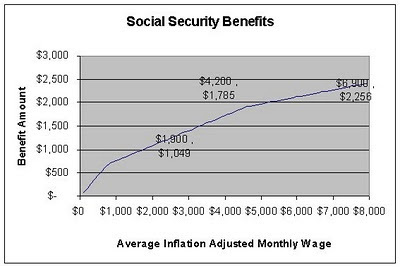 If your income is $58,000 at retirement then you would get a SS check of around $1,400 a month. Between the annuity and the SS income you would be getting monthly income of $4,000. This is 82% of your pre-retirement income. That is a very health post retirement income level considering that SS portion is mostly untaxed and that you are not paying SS/medicare taxes. Note: The numbers I use are based on several variables and most of them are not set in stone. I'm assuming you save starting in your 20's and many people don't get such an early start on retirement. I'm assuming that bonds average 6% long term in the future based on historic trends but theres no guarantee on that. I'm also working with current annuity pay out rates which are also likely to vary in the future. The safety of this strategy comes at the cost of settling for a lower return on your investment. Buying bonds has a much lower historical return than investing in the stock market. If you have a low risk tolerance or want to ensure that you have at least a minimum level of retirement income then using bonds and annuities is one way to go. But if you want to take on some risk then buying stocks or a mixture of bonds and stocks will very likely result in higher returns over a long period. Save 80% Off Restaurant.com $25 Gift Cert. orders. Use code CHOW and Pay $2 thru 4/6/10. Right now inflation in the USA is about 0%. The BLS site says that for February 2010 the CPI (Consumer Price Index) which is our measure for inflation was "unchanged". I was curious how inflation was looking in other nations around the world so I chose to find the inflation rates for the G20 nations. The G20 nations represents 80-85% of the world economy so looking at those 20 countries gives a quick picture of most of the world. I got inflation figures off of the site IndexMundi. They have nations ranked by inflation levels. The inflation figures are rounded to whole percent numbers and are at least a month dated based on the source. So this isn't meant to be a perfect, up to the minute measure of inflation but a general picture of inflationary trend this year versus last year for most of the worlds economy. As you can see a few countries have negative inflation or in other words they are seeing deflation. Almost every nation on the list has lower inflation in 2010 than 2009. Only India has seen inflation increase. Average inflation rate is 3.5% in 2010 and it was 6.2% in 2009. Median rate is 3.0% in 2010 versus a 5.0% median in 2009.